This article originally appeared in DuJour Magazine. Photos by Douglas Friedman. When you tell people that you’ve just returned from the most luxurious, mind-blowing trip of your life, and that the exotic destination was not Mauritius or the Maldives, but Oman—a small Middle Eastern country bordered by Yemen and Saudi Arabia, just a boat ride away from Iran—they will stare at you blankly, as if waiting for a punch line. Those who’ve been, however, know that Oman is one of the most peaceful, politically stable places in the world, despite its geographic coordinates. In fact, a recent World Economic Forum report ranked Oman ninth out of 141 nations in terms of safety. (The United States ranked 73rd.) So, yes, it’s safe. But it is also astonishingly beautiful. 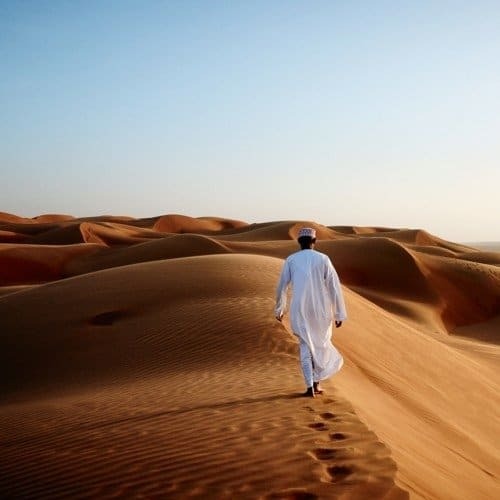 The northern region alone—just an hour flight or four-hour drive from Dubai—has beaches reminiscent of Ibiza, a desert that rivals the Sahara and mountains so startlingly barren, you’ll feel as if you’ve been transported to Mars. Wealthy Middle Easterners and well-heeled Europeans have been holidaying in Oman for years—Prince Harry even visited in 2014—but the country has remained largely under the radar with American travelers. There is perhaps no greater initiation into Omani culture than arriving, like I did, on the eve of National Day, a 48-hour-long extravaganza filled with fireworks and camel races and parades, celebrating the country’s national identity and independence. It seemed the entire city had been wallpapered with images of the country’s leader, Sultan Qaboos bin Said, a regal, handsome man of 75 with mocha skin and kind eyes, whose birthday coincides with the national holiday. There he was, painted onto the facade of office buildings, fluttering in flag form outside of homes, decals of his likeness wrapped around nearly every vehicle in sight. Still, the sultan is intent on preserving the country’s traditions. You won’t see a single high-rise in Oman’s capital city of Muscat; instead, the skyline is dotted with palm trees and mosque minarets, as policies forbid structures from standing higher than the local place of worship. If Dubai is the Las Vegas of the Middle East, Oman might as well be the Amish Country. The city is virtually spotless—not a single stray soda can or sticky piece of chewing gum is visible, and it appears as though everyone in town has just come from the car wash. Which is because they probably have: Driving a dirty car here is considered illegal, and violators are subject to a fine. Just 20 minutes from Muscat International Airport is The Chedi, where I had booked a room for the first few days of my trip. It’s the kind of hotel that should come with a warning label—which is to say, once you experience The Chedi, anywhere you stay after will feel like a disappointment. Morning mist at The Chedi Muscat, one of Oman’s many five-star hotels. Stroll through the property and you’ll notice crouching hotel staffers dispersed throughout the vast, verdant grounds with scissors in hand. “It looks more natural this way!” one of the gardeners says, cheerfully snipping away. That same painstaking attention to detail can be found in the restaurant, too, where every nuance of the morning breakfast spread has been carefully considered: Platters of sliced cucumbers are delicately sprinkled with black and white sesame seeds and garnished with fresh mint. There are heaping piles of lox, baskets of piping-hot pita bread and handmade macarons for miles. Many guests spend days without ever leaving the premises. But those keen on an immersive experience can enlist an outfitter, like California-based Mountain Travel Sobek, to handle logistics. (They curated my itinerary with the help of Zahara Tours, a local operator.) Mountain Travel Sobek is just one of several U.S. agencies that have recently launched programs in Oman. The destination, they say, is ideal for adventure-seeking jet-setters who want an off-the-beaten-path experience that still feels luxurious. High-end hotel brands are also placing their bets on Oman as the next big thing for affluent travelers: Jumeirah will unveil a beachfront development in 2017, Kempinski Muscat is set to open this year and Anantara has two properties nearing completion. The hotels will join an already impressive portfolio of five-stars in the area, including Ritz-Carlton, Six Senses and Shangri-La. Graffiti celebrating Sultan Qaboos bin Said. Police closed off the highway to protect the artists as they painted. The mountaintop resort Alila Jabal Akhdar has an infinity pool that disappears into the horizon. An expat hotel manager will later describe Oman as “not yet slick” when it comes to tourism, and he’s right. My scarf-tying ineptitude might have presented the perfect sales opportunity for a savvier destination. But from what I gather, gracious hospitality is ingrained in the Omani culture; hustling visitors is not. We’re on the road before sunrise the next morning, headed south toward the desert. The scenic drive from Muscat to Wahiba Sands should be two and a half hours, but we take our time, stopping along the way to explore ancient forts, unspoiled villages and undulating creeks with fish that nibble at your toes. 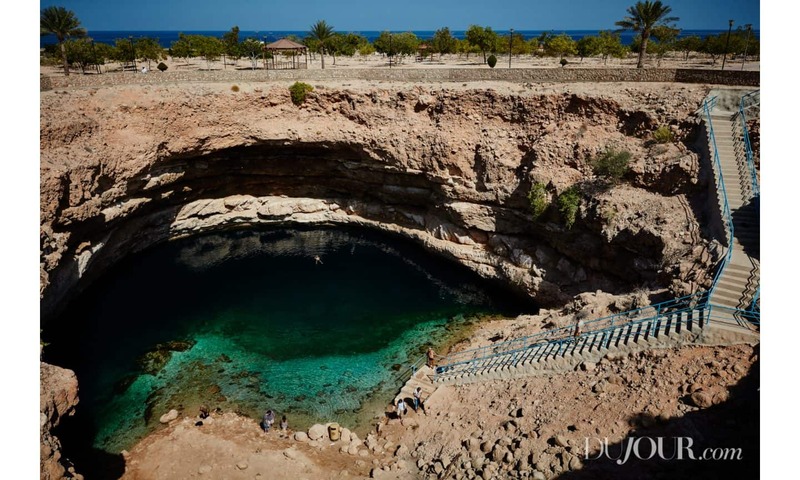 We pull off the highway to see the Bimmah Sinkhole, a gargantuan hollow filled with emerald water that looks like something out of a movie. The site is considered a must-see “tourist attraction,” and yet, there’s only one tourist: a pudgy Frenchman splashing around in a pink Speedo. Nearing the desert, we stop at a gas station to let the air out of the tires, which is apparently a prerequisite for navigating Wahiba’s golden dunes. Unbeknownst to me, Naheed has arranged for us to have lunch with a Bedouin family. We’re invited into their thatched-roof tent for a meal of chicken and rice. Naheed eats with his hands, so I do the same. It is blissfully silent. An intricate chandelier inside the mosque’s male prayer room weighs a startling 8.5 tons. After two nights in the city and two nights in the desert, we head to the mountains. Our trip will culminate at Alila Jabal Akhdar, a boutique resort that sits 6,500 feet above sea level and overlooks a sprawling gorge. Getting there requires a rigorous trek up the Al Hajar mountain range, during which I’m told to keep an eye out for dust clouds in the distance. (Naheed will later explain this is mountain methodology for avoiding an oncoming vehicle.) There are moments when the jagged, unpaved roads (tons of boulders, zero guard rails) become so treacherous that the prospect of toppling into a ravine below doesn’t feel far-fetched. But when you arrive at Alila, suddenly the hours of white-knuckling seem like a small price to pay. The secluded, 86-room hotel—constructed almost entirely of local stone—is camouflaged into the surrounding landscape and has the calming energy of a rustic mountain lodge. Most guests come for several days to completely disconnect, and that’s easily accomplished here: The Wi-Fi is spotty, the food is divine and the sunsets are otherworldly. We spend our final day traversing back down the mountain, past crumbling clay homes and villages that seem frozen in time. We stop every few miles to shoo a herd of unruly goats occupying the dirt road. After what seems like a lifetime, we reach level ground and the first signs of modern life begin to materialize: a highway, a small tea shop and, of course, a car wash.
“Didn’t you say that you wanted to see the inside of a home?” Naheed asks. I had, several days ago, briefly expressed my curiosity. We’d spent a week ogling the immaculate, whitewashed houses that typify Omani architecture, and I couldn’t help but wonder what life looked like behind closed doors. “I think my cousin’s son Rashed lives in this area. I will call and ask if we can have a tour,” says Naheed, who tells me he hasn’t spoken to the aforementioned relative in years. While the idea of showing up to someone’s home unannounced—and uninvited—sounds slightly mortifying, Naheed insists. “Omani hospitality,” he reminds me. Each Friday morning in the ancient city of Nizwa local farmers host a live goat auction. Twenty minutes later, I am settled into Rashed’s majlis (Arabic for “sitting room”), cradling his newborn baby and snacking on syrupy dates, which were grown on the family’s date-palm grove approximately 100 yards to my right. The majlis doesn’t have a single piece of furniture, but there is a flat-screen television mounted to the wall playing SpongeBob SquarePants with Arabic subtitles. Rashed asks to take a photo of me holding his child. American tourists are a novelty here, he explains, and many of his friends will be envious that he’d hosted someone from America for coffee and dates. He sends me home with a hefty stash of them, fresh from the grove. Several days later, when I’m back home in New York, I slice open the sticky plastic bag and pop one into my mouth. It’s even sweeter than I remembered. A friend of mine pointed me to this post. Good read, interesting look into Oman. it’s a truly amazing place.